A. A laundromat, and next door, a Chinese restaurant. A. Somewhere in Tampa, Florida. A. In Episode 6 ("Toys"). We first see the laundromat, at 04:39, when creepy Colin Belfast follows Heidi into the laundromat, pretending to be doing laundry himself. He strikes up a conversation, and eventually convinces her to go to the next-door restaurant for a meal. Then we see the Chinese restaurant at 12:47, as they share a meal inside, and he feeds her a phony story about being a divorced veteran who went through the Homecoming program, while digging to see if she has any remaining memories of Homecoming. A. A coin laundromat and a restaurant - but not a Chinese restaurant. A. You can find both of these two small businesses side-by-side in a Burbank strip mall. and it's at 508 S. Glenoaks Blvd, in Burbank, CA. at 510 Glenoaks Blvd., Burbank, CA. 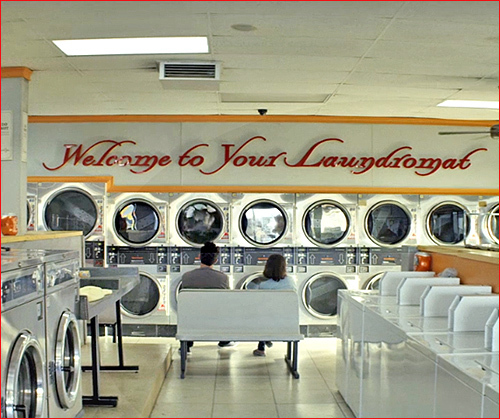 The laundromat was shot pretty much as it is in real life. 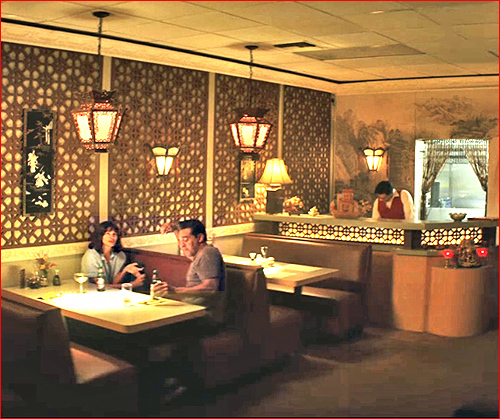 But they completely remade the interior of the Green Garden Cafe ( which, in real life, is a Middle-Eastern restaurant ), transforming it into a Chinese restaurant for the scene. This strip mall is located about four miles northeast of Universal Studios Hollywood. Burbank is a city in the San Fernando Valley, best known for its studios, which include the huge Warner Bros studio the Walt Disney Studios., and the former NBC Studios (where Tonight Show host Johnny Carson helped put the town on the map by regularly poking fun at "Beautiful Downtown Burbank"). A. This was an interesting challenge to track down. I spent a ridiculous amount of time trying to find that laundromat. And at first, nothing I tried worked. There are zillions of coin-op laundromats in Los Angeles County, and they all look pretty much the same to an outsider. There weren't many clues to go on from the scene, only a slogan on the wall that read "Welcome to Your Laundromat" . I could also see the number above the door of the laundromat from inside – it was backwards, but it appeared to read 208. So I searched all over town for a laundromat with the street address of 208, and came up with two of them – but neither one matched. I couldn't see a laundromat in that photo, but I could make out the name of one of the adjacent businesses, and it read "Bite Me! ", the name of a café at the far right end of the strip mall. Fortunately, that's a unique name, and I realized it should be easy to track down. And it was (despite the fact that it had gone out of business in May 2018). It turned out to be located in a strip mall on Glenoaks Blvd, in Burbank. And when I looked at a StreetView of that "Bite Me Café" address, sure enough, it was the same red-tiled strip mall, and there was a coin laundry just a few doors down, called "Nice N' Clean". Once the scene shifted to a Chinese restaurant next door, I checked to see if there was really a restaurant next door to the "Nice N' Clean" laundry, and sure enough there was. However, it wasn't a Chinese restaurant, it was a Middle-Eastern one. 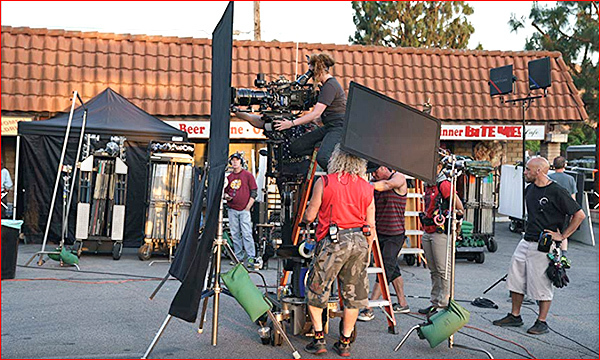 I wasn't 100% sure that they had actually filmed that Chinese restaurant scene in that Middle Eastern restaurant, but it seemed likely, given that the location scouts had probably made an effort to find a laundromat right next to a restaurant. I knew that it would require a major interior makeover to make a Middle Eastern restaurant look like a Chinese one, but I also realized that wouldn't be a big challenge for Hollywood, if they wanted to do that. I emailed the restaurant, asking if the show had filmed there, but I got no response. 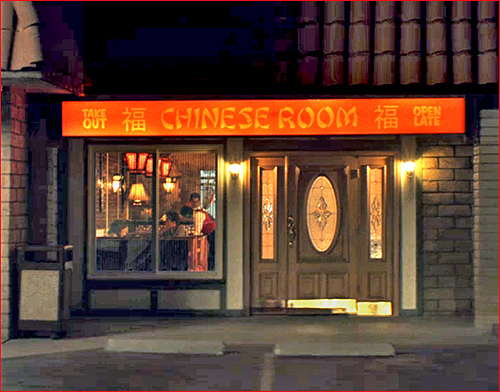 Fortunately, the show itself answered that question, when they eventually had an exterior camera shot that not only showed the distinctive wooden door on that restaurant, but also looked directly into the restaurant's front window to show the Chinese decorations inside.